Suntree also has Day Parks sprinkled randomly around the community. A respite that may be near your home where you can relax, walk your dog, enjoy a picnic lunch or dinner, fish in the lake, or just relax and soak up nature. Following is a list of those parks, their location, and map coordinate. Interlachen Park can be found at 409 Interlachen Road (D-2). This park is over 5 acres and has a shaded playground and pavilion. Like Jack Mahon Park, you'll find a wide variety of equipment including, slides, swings, climbing bars, and other fun stuff for children. Interlachen Park also has a Little League ball field overlooking one of Suntree's numerous scenic lakes. Newly built in 2018 is a half-court basketball court. Jack Mahon Park is located at 7550 Spyglass Hill Road and is over 15 acres. (G-2 map location) A huge shaded playground has a contemporary set of play equipment including twisting and straight slides, climbing and hanging bars, tire swing along with toddler and children swings. A covered pavilion with fans and electricity to house your party or event at any time of the year. Residents may reserve the pavilion by calling the SMHA office at 321 242 8960. You'll also find regulation basketball and bocce ball and horseshoe courts at the park. Bocce ball and horseshoe equipment is available free (with $20 refundable deposit) at the SMHA office. There's a regulation size soccer field that is also used for baseball. Suntree Master Homeowners Association maintains over 1,000 acres of lakes and waterways providing spectacular scenes of tranquility and nature. These precious gems are the reason many residents have chosen Suntree. Residents are allowed to fish in these lakes and non-motorized boats, kayaks, canoes, etc., are also permitted. Along with providing recreation and relaxation for Suntree residents, these lakes and waterways are a vital key to the area's stormwater management. Under the guidance of St. Johns River Water Management District and the cooperation of Brevard County, Suntree maintains a series of weirs to control water levels throughout the year and during serious storms. Suntree follows the Florida Department of Environmental Protection maintenance control plan. Suntree Country Club offers 36 holes of Championship Golf. Both course greens have been completely renovated with Tifeagle and Champion hybrid Bermuda grass, which beautifully maintain the integrity of the original designers. Multiple tee box locations have also been added to accommodate all levels of play. The Suntree Golf operation is supervised by Head Golf Professional Brent Naylor. In addition to golf, tennis and social/pool memberships are available. Suntree residents enjoy over 100 miles of winding trails throughout the community. Whether it's a casual stroll, jogging, riding your bike, skating, or taking your children for a ride, you'll encounter a myriad of plant species and a wide variety of birds and animals. These lovely trails accentuate the gifts of Mother Nature. Jack Mahon Park now has a tennis/pickleball court. Reservations can be made on this site. 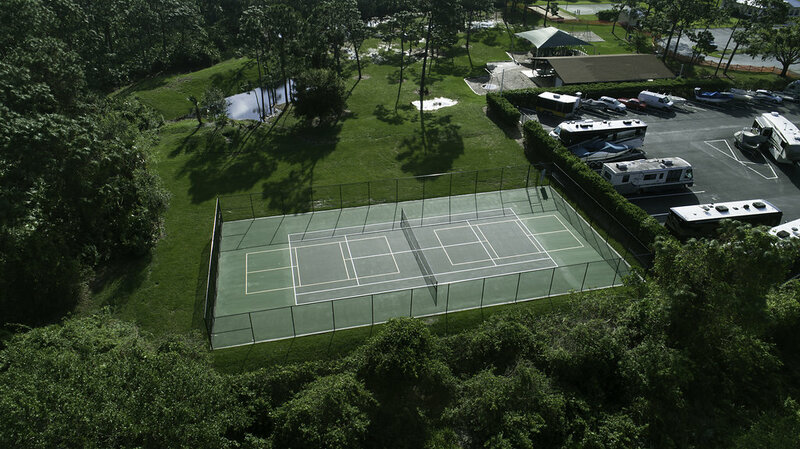 Constructed in 2017 in spite of the hurricane, it is available for singles or doubles play.